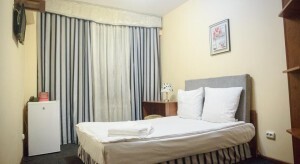 Featuring free Wi-Fi and a steam bath, this hotel is located in Almaty city, 8 minutes’ walk from Sayakhat Bus Station. Merey Shopping Centre and Green Market are 700 yards away. Each room at Relax Hotel is decorated in warm tones and includes a fridge. Guests benefit from the flat-screen TV and slippers. Asian cuisine is served in Relax’s café, where European dishes are also offered. Drinks can be enjoyed at the bar. There is the steam bath at Relax Hotel, and the Gorkiy Park with the City Zoo are 1.2 miles away. Rymbek Metro Station is 15 minutes’ walk from Hotel Relax, providing access to Almaty city centre with the Monument of Khazakhstan Independence. Almaty Airport is 8.1 miles from the property.